The Softchoice.com Order Reporting tool allows you to view and export your purchase history. You can customize your reports based on your own requirements and save them for repeat use, or you can use the pre-defined reports we set up for you. 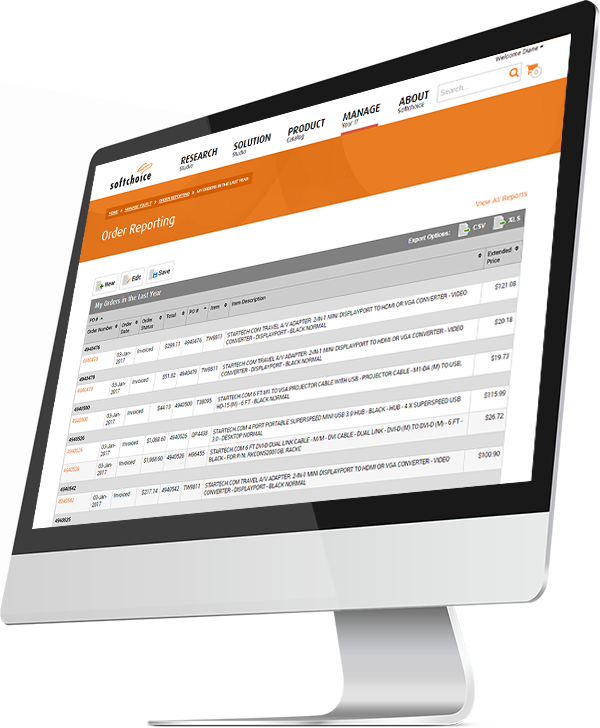 Our Order Reporting tool allows you to easily build custom reports using the Reporting Wizard, selecting fields that are relevant to you. Save your reports for future use, or select from one of the pre-defined reports. What options do I have to customize my report? There are many options - you can filter your report based on order status or shipping location, you can choose an order report or a detailed order items report, you can select which columns you want to include and then move the columns around into your preferred order, and more. Can I edit my report after I build it? Yes, you can re-open the Reporting Wizard and make changes. How do I save my custom report? You can click the Save button, name your report, and save it. You will be able to access it on the Reporting page. You have the option to export your report in XLS or CSV formats. The Export options are in the top right corner of each report. To enable Order Reporting or to learn more about this feature, fill out the form below. A member from our Sales team will reach out to you shortly.